Russell Wilson threw for 204 yards and two touchdowns in the Seahawks 27-17 victory over the Redskins. Seattle controlled the whole game never trailing and got off to a 17-0 lead, before Washington was able to score. The Redskins have now lost 12 of their last 13 regular season games dating back to last season. Wilson ran for 122 yards and scored a rushing touchdown also. Marshawn Lynch had 17 carries for 72 yards and five receptions for 42 yards with a receiving touchdown. 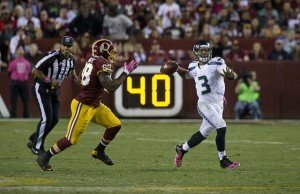 Wilson continued to prove why he’s the next big quarterback in the NFL. Kurt Cousins completed 21 of his 36 attempts for 283 yards and two touchdowns. Alfred Morris struggled Monday night rushing for only 29 yards on 13 carries. DeSean Jackson had a big game, with five receptions for 157 yards and a touchdown. Seattle improved to 3-1 and to 21-8 on Monday night football. It was the Seahawks ninth straight win on Monday night football. Under Peter Carroll the Seahawks are 11-1 on prime time games. Seattle will host Dallas (4-1) next week. Washington falls to 1-4 and their third straight. The lose is also their seventh straight prime time game. The Redskins will travel to Arizona to face the Cardinals (3-1) next week.